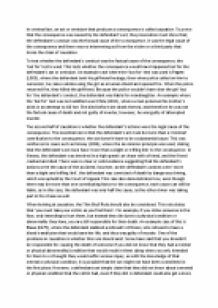 Explain what is meant by the term 'causation' in criminal law and assess how the courts have interpreted its significance in determining criminal liability. ﻿In criminal law, an act or omission that produces a consequence is called causation. To prove that the consequence was caused by the defendant?s act, the prosecution must show that; the defendant?s conduct was the factual cause of the consequence, it was the legal cause of the consequence and there was no intervening act from the victim or a third party that broke the chain of causation. To test whether the defendant?s conduct was the factual cause of the consequence, the ?but for? test is used. This tests whether the consequence would have happened but for the defendant?s act or omission. An example case where the ?but for? test was used is Pagett (1983), where the defendant took his girlfriend hostage, then when police called on him to surrender, he came outside using the girl as a human shield and opened fire. When the police returned fire, they killed the girlfriend. Because the police wouldn?t have shot the girl ?but for? the defendant?s conduct, the defendant was liable for manslaughter. An example where the ?but for? test was not satisfied was White (1910), where a man poisoned his mother?s drink in an attempt to kill her. She died before she drank the tea, and therefore he was not the factual cause of death and not guilty of murder, however, he was guilty of attempted murder. 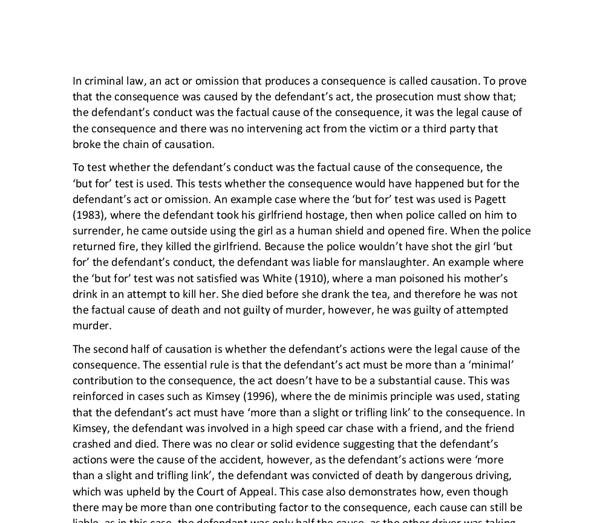 The second half of causation is whether the defendant?s actions were the legal cause of the consequence. ...read more. In Deer, the defendant should only have been guilty for the initial injuries, as the victim should not have made the wounds worse and sought medical treatment to save their own life. A chain of causation can be broken by an intervening act. An intervening act can be; an act of a third party, the victim?s own act or a natural but unpredictable event. An intervening act is defined as an act that sufficiently separates the defendant?s conduct from the consequence. However, there are some acts, such as medical treatment that are unlikely to break the chain of causation. This is to stop doctors or surgeons from not performing operations that could render them criminally liable if they make a mistake. This was proven in the cases of Smith (1959) and Cheshire (1991). In Smith, two soldiers were fighting and one was wounded. He was taken to a medical centre and given artificial respiration, but this only made the wound worse, and then the victim died. It was ruled that the defendant?s act was an ?operating and substantial cause of death? and thus was guilty of murder. The phrase ?operating? is used here as the wound was still there when the victim died. However, in Cheshire, the victim was shot and the wound had healed up before he died. The victim had died from complications due to the tracheotomy he had received, however, the defendant was still liable for his death, as it was a ?significant? cause of death. ...read more. For example, whereas a defendant will not be liable for injuries caused by the victim jumping out of a window simply because the defendant shouted abuse at the victim, the courts should still treat the abuse as a separate crime, and in this case, the defendant would be convicted of common assault, as he placed the victim in a state of fear. To conclude, the courts can interpret the law effectively in a majority of cases to ensure justice is upheld. This is shown in cases of Smith, Cheshire, Jordan and Pagett, where all who were liable were very much guilty in the eyes of morality and common sense. There are also sufficient tests in place, such as the ?but for? test and the ?Daftness Test?, that look at the actions of both the defendant and the victim to judge where liability lies and if the victim acted unreasonably, or if a consequence would have occurred even if the defendant did not commit the act. However, there are also cases where defendants are made liable for crimes they shouldn?t be, shown in the cases of Blaue and Deer. It is quite obvious the courts are attempting to make defendants liable in the name of safety, as the courts could be criticised by people of certain beliefs if they let people ?get away? with certain crimes, even if the defendant?s incompetence resulted in the consequence. So though the courts are capable of interpreting the law in order to make the correct people liable, it could be said they are too aggressive in convicting, and do not consider intervening acts as considerably as they should. ...read more. This category is justified as it promotes higher standards of care for the vulnerable. However this category could mean that acts of kindness could bring them legal duty which people may not be aware is criminally liable. This law also imposes on people who may not be competent or may be ?inadequate?. Medical treatment is less likely to break the chain of causation unless it is so independent of the defendant's acts and in itself so potent in causing death that the defendant's acts are insignificant. In Smith (1959), D stabbed V with a bayonet during a fight in barracks. If one read for ?disease of the mind? ?disease of the brain?, it would follow that in many cases pleas of insanity would not be established because it could not be proved that the brain had been affected in any way, either by degeneration of the cells or in any other way. However, this criticism is debatable, as the current law ensures that any individual who is contractually or legally obliged to perform a task is liable for failing to do so. The same can be said for individuals under other duties, such as the duty through relationship. They are factual causation and legal causation. With factual causation the defendant can only be guilty if the consequence would not have happened ?but for? the defendant?s conduct. This can be shown in Pagett where the defendant used his pregnant girlfriend as a shield while he shot at armed police officers they shot back and the girlfriend was killed. There are, however, constitutional limits on the power of government officials in order to prevent them from abusing the rights of individuals, including those accused of criminal behavior. The constitutional rights of the accused are the following.The Fourth amendment protects individuals against unreasonable and unwarranted searches and seizures of their property. that is proposed by Ormerod, "in some cases there will be obvious advantages in presenting the case under s.3 to focus the jury's attention on the existence of the duty rather than straining to persuade them of a relevant representation".